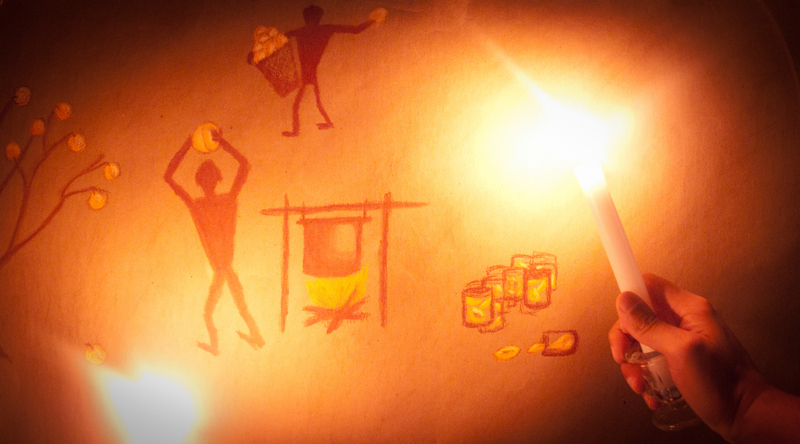 Cave man drawings. Sometimes that Raj guy cracks me up. Now, I am no “paleo puritan” by any stretch of the imagination, but I didn't see this as “paleo”. Whole food, real food, homesteader, or even hipster: yes! 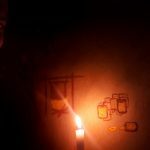 The truth of the matter was writing down every step in the process is what I dreaded. I suppose cavemen would do things like dehydrate, cure or ferment. 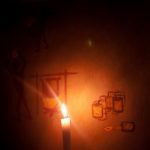 Maybe they fashioned jars from stone, or burned sand to make containers… I don't know, I wasn't there. I will not pass judgement. 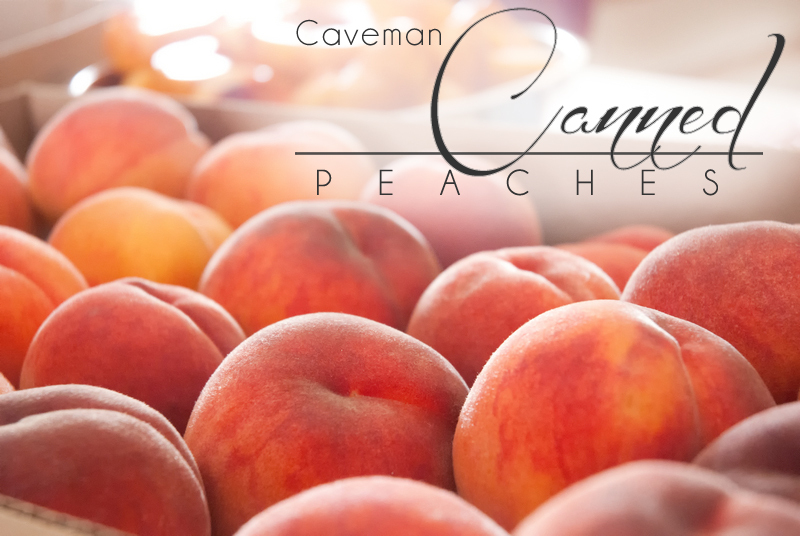 Paleo or not this canned peach recipe is easy, preservative- and sugar-free. Something you can feel good about eating all year long! 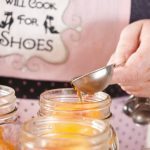 Canned peaches, free from chemical preservatives and sugar, so easy to do! 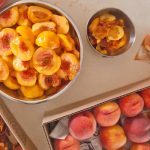 Sort through your peaches, make sure that they are ripe (green peaches are hard to process). You can determine if they are ripe if the give way when you apply just the slightest pressure to the stem. 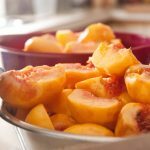 Careful: you don't want to bruise your poor peaches; any that are starting to turn or are quite bruised, I wash and pit and put them into a freezer bag to later make jam or sauce (great for wings). 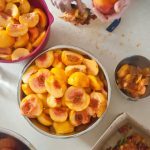 Blanch your peaches: do this by dipping them into the hot water for 20-30 seconds then dropping them into a cool water bath. 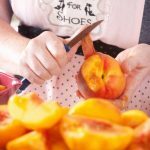 Once blanched the peach skin slides off easily. You can half the peaches. I like to slice them. You can put them directly into your sterilized jars. I use a hybrid raw packing method. 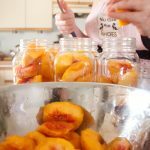 I put the raw fresh peaches into the jars, packing them in as tightly as possible. The “3 Ways”: I add 1 tsp of maple syrup, vanilla bean (or 1/2 tsp extract), or 1 tsp of honey (optional) to each jar. You can also add 1 tsp of lemon juice here if you are concerned with discoloration. 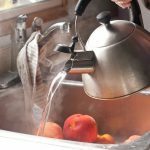 Bring your kettle to a boil and then add the boiling water to the jars leaving 1/2 inch headspace to space between the liquid and the top of jar. Usually, this is just to the neck or where the threading starts. 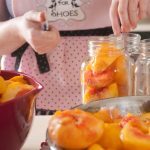 Using your chopstick or fancy canning tool remove any air bubbles from the jar by moving the peaches around. The air can cause an issue sealing, diminish the shelf life, and cause discoloration. 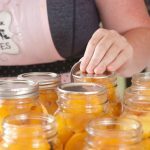 When your timer is complete, remove jars carefully from the boiling water and put on a thick towel (I used a towel-lined peach box). Leave them alone now for 24 hours. 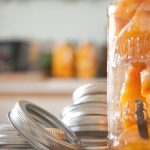 As they cool you will hear the “pop” of cans sealing, this is the sweetest sound when canning. After 24 hours, any cans that haven't sealed, (the top is not concave), refrigerate and consume in the next few weeks. 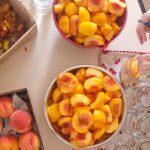 Or muddle some of those peaches with some bourbon and top with soda to console your canning wounds. I use only boiling water, no sugar or sweetener nor vanilla of any kind. That is what Raj was raised with, but he may have grown a sweet tooth by now! Good for you with all your canning. I canned apple pie filling this year, usually freeze it, but the freezer is too full now! Also canned smoked salmon this morning! Happy canning! That is his fave. Just the plain peaches in boiling water. We did 50lbs for his cupboard and the majority were just plain. 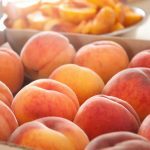 The peaches are so delicious, they don’t really need more. I have the same too full freezer problem… My mom too! It’s a sickness! Happy canning to you! Sunday is going to be a full day of salsa here! I think I might try this!!! 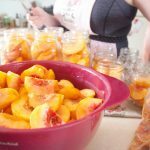 I hate the sticky syrup part of canning peaches AND I am trying to eat less sugar!! They are good???? 🙂 Thank you! As good as the peaches are to start! 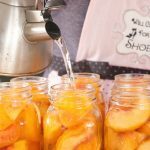 I prefer the less sweet water canning personally, they don’t have as long of a shelf life… but we are lucky if we have any leftover by the time we circle back to peach season.